When you meet up with Horley in Blackwater he will tell you to go help the various sheriffs with tasks they have. 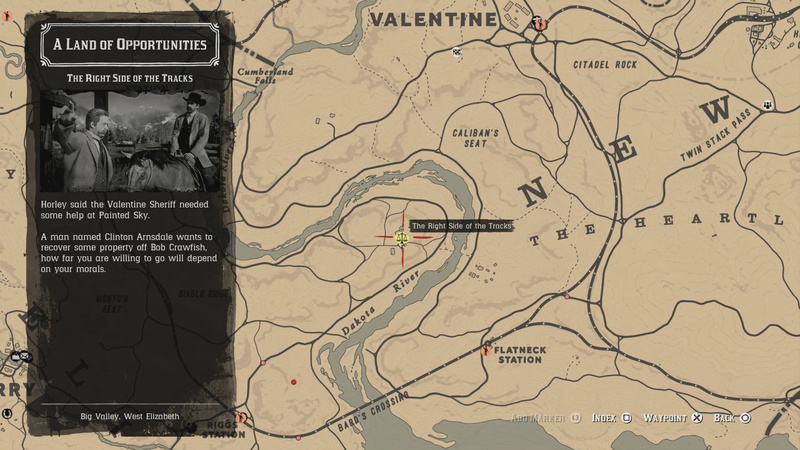 One of the of Sheriffs can be found near Valentine in a mission called The Right Side of the Tracks. Use our The Right Side of the Tracks guide below to complete this mission. Note: This is an Honorable/Dishonorable choice mission. The outcome of your choice impacts your story mission strand (there are two paths: honorable/dishonorable with two missions a piece). Both strands can be accessed with the same online player (by simply raising/lowering honor after completing the three Sheriff missions). You will find the mission The Right Side of the Tracks near Caliban’s Seat. Horley said the Valentine Sheriff needed some help at Painted Sky. A man named Clinton Arnsdale wants to recover some property off Bob Crawfish, how far you are willing to go will depend on your morals. 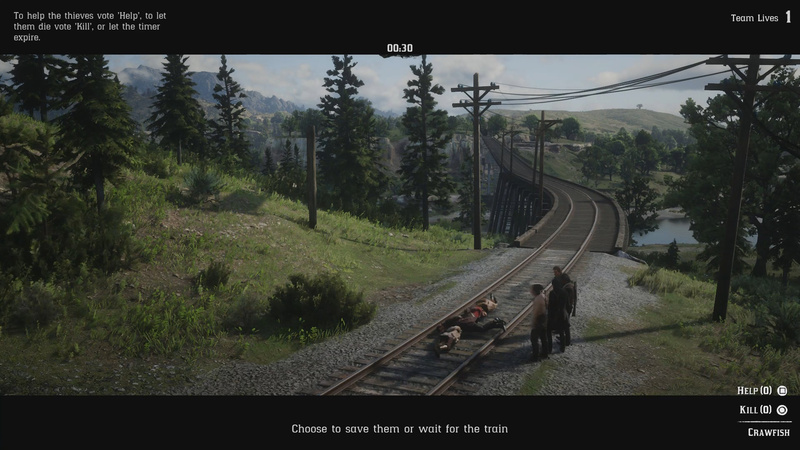 Once you’ve watched the cutscene, The Right Side of the Tracks mission will begin. Required players 2 – 4. 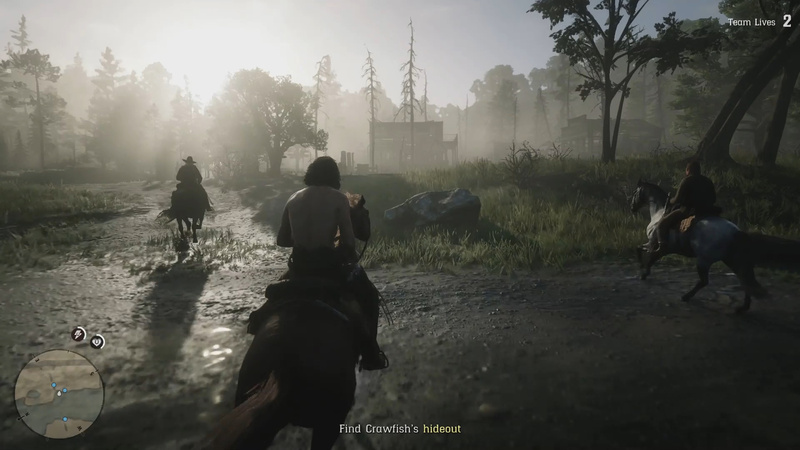 As soon as the mission starts you will need to mount your horse and ride to the hideout. Before you reach the hideout you may want to jump off your horse and take cover. 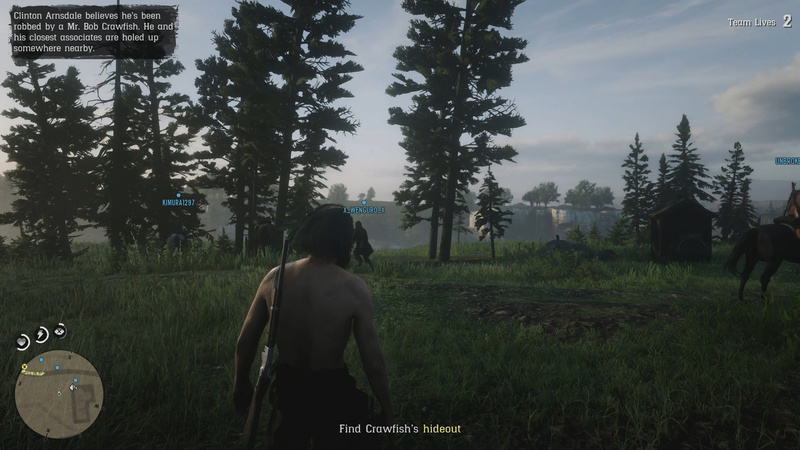 When you begin this mission Clinton Arnsdale will tell you to go see Bob Crawfish at his hideout. To reach the hideout jump on your horse and follow the mission path. The hideout itself is only a short ride from the mission start. When you reach the hideout you will want to jump off your horse and take cover immediately as there are a number of enemies there. At the hideout you need to kill a number of Crawfish’s guards. Once you’ve killed enough of Crawfish’s men, a cutscene will trigger. 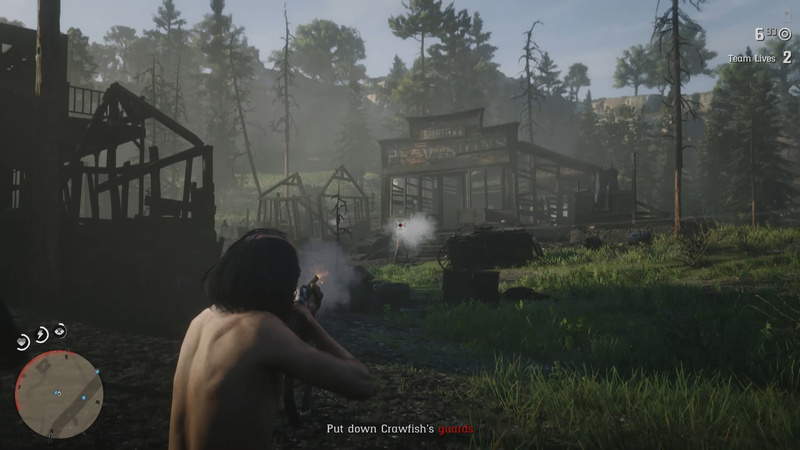 At the hideout you will get a new objective to put down Crawfish’s guards. These guards are littered throughout the place and can be taken down using lethal methods. In order to advance the mission you need to kill the guards until a cutscene triggers. 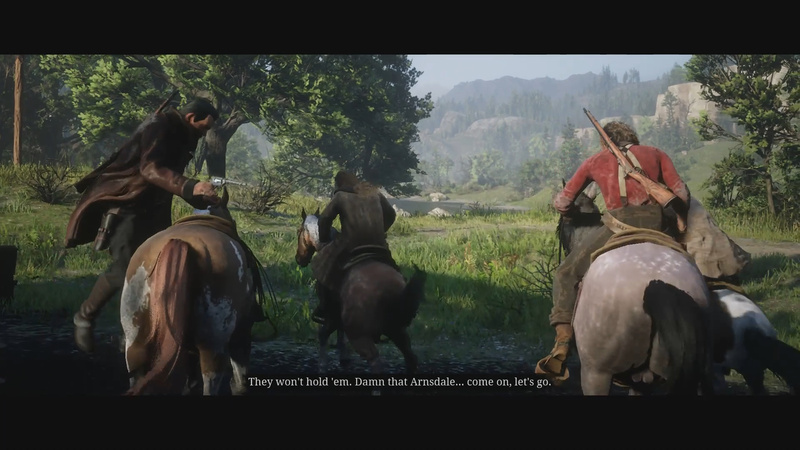 In the cutscene Crawfish and pals break for their horses and ride away. Catch up to one of the enemies and Lasso them. Hogtie the enemy and place it on your horse. When Crawfish and his gang takeoff you are then tasked with catching up to them and hogtying them. Depending on the number of players you have determines how many enemies there are to hogtie. Since I played this with three other players, there were a total of four enemies we needed to catch and hogtie. As you chase them the gang will split up with some going across the river. If you have audio communication it is best to each member of your team after a specific enemy. Regardless catch up to your target, lasso them, hogtie them, and then load them on your horse. 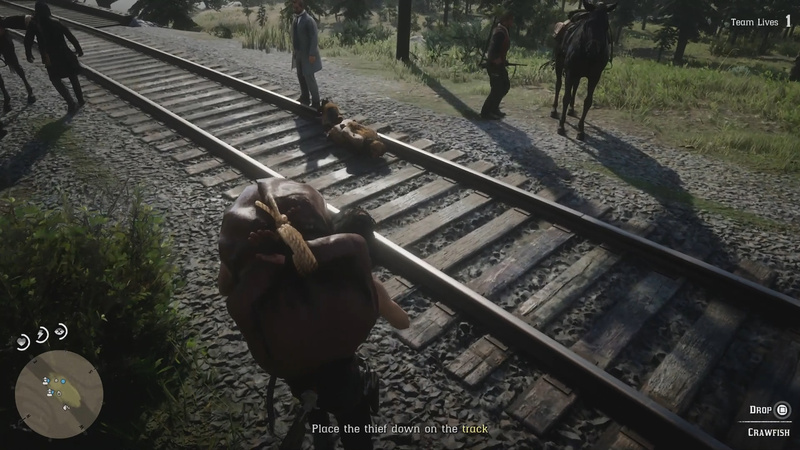 Place the thief on the tracks to trigger a cutscene. After the cutscene you will have a bit of a tough choice to make. With your target safely stowed on your trusty steed it is time to take them to meet Arnsdale. 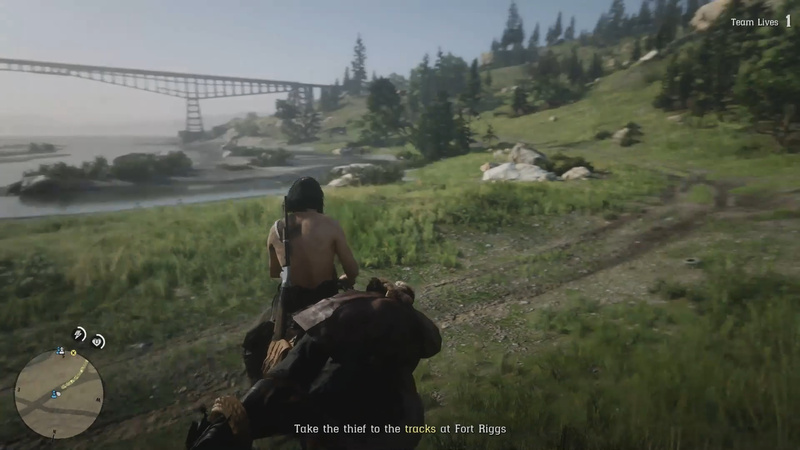 The location Arnsdale wants you to deliver the thieves is the tracks at Fort Riggs. Luckily for us we were already headed in that direction anyways. To reach the Tracks simply follow the quest marker (or use the large railroad bridge as a landmark). When you reach the Tracks take the thief off of your horse and throw him onto the Tracks (inside the yellow area on your minimap). Once you’ve done this a cutscene will trigger. 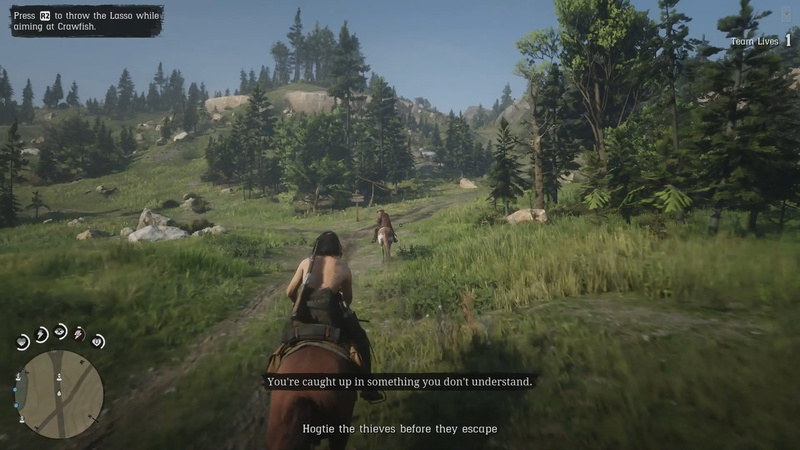 After the cutscene you will have to make a choice whether to Help or Kill the thieves on the track. Choosing to Help is an honorable choice while choosing to Kill is a dishonorable choice. After the outcome of your choice the mission ends. Thoughts on our The Right Side of the Tracks guide? Drop them in The Pit below.